I went back home to Ipswich for a long weekend and am now back in London, only to be almost about to vanish off to north Wales for a week. We leave on Saturday morning so I need to do various chores tomorrow, such as like.. getting my laundry dried so I have clothes to wear in Wales. I am an adult. In Ipswich, I was visiting a family member in hospital a lot (now out and doing well) and in the evenings I started watching the 1980s Peter Wimsey/Harriet Vane BBC series. I mean... really. Harriet Walter as Harriet Vane is peak, "I want to be her and I am also in love with her" for me. I can't stop thinking about her hair, her high voice, her mannerisms... and I've only seen like three episodes. Need to do better, need to watch more. Witchmark, by C.L. Polk. This is KL Charles-ish second world fantasy romance with a mystery. Not necessarily my favourite kind of thing (the writing is fine but usually I like prose that's a bit more stylised than this) but it's quite a soothing read. It only came out on Tuesday so this one is not even close to being abandoned yet. Am also trying to find my way into The Poetics of Space, by Gaston Bachelard. Horrible suspicion that I'm not really clever enough for it. Read the first few pages of The Dragon Waiting on the tube today after getting it from the library. I think this might be a good thing to read after the recent Daughter of Time debacle. I read a good chunk of I'll Stand By You, the book of letters between Sylvia Townsend Warner and Valentine Ackland, but I haven't picked it up in a few weeks. It's very wonderful and full of love and cleverness and strange stories. I started Orlando by Virginia Woolf and it's full of a lot of beautiful stuff (the ice-skating!!! I perish) but also lots of astonishing racism. Why. I mean, I know the answer. Just, it has me dragging my heels on continuing with it. 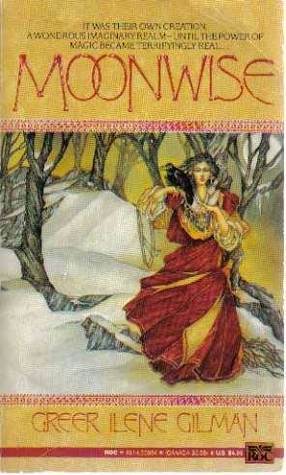 I ordered a copy of Greer Gilman's Moonwise from the USA. I ordered the old paperback because I am shallow and I love the cover of it, whereas I am not such a fan of the more recent hardback. But it hasn't turned up yet and it feels like it's been a million years. Where is my book!!! But it hasn't turned up yet and it feels like it's been a million years. Where is my book!!! Ha. I know the feeling! I hope it comes soon. (And that is a very pretty cover.) Possibly actually wanting to be reading that is prejudicing the fate of the others?